If you have any questions or want to enquire about dates, use our form to contact Helen Verle or see their website for more information. Head straight through the back door into a cosy kitchen, where you peel potatoes looking out over the garden and trees, chat to the cook by the long counter, throw the windows open to the outdoors. A key will be sent in the post ahead of time, so let yourselves in. On chilly days light a fire from the stash of kindling, unplug and enjoy – a curl of wood smoke scenting the air, the only sound the crackle of flames, birdsong and the popping of corks when you open the wine. Upstairs there are three snuggly bedrooms, and outside the kind of garden that invites young ones to go semi-feral – building dens, playing pirates and adventuring in the long grass and ferns. City dwellers will love the wildness. Spend lazy days pedalling the quiet lanes of Finistère where the pace of life is slow. Potter between chapels and churches, brocantes and farmers’ markets, and return to nap in the hammock under the dappled sun. Minimum stay: 7 nights in high season. Day bed available in lounge suitable for a child. This was the second time that we have stayed in this wonderful gite. It is peaceful and well equipped. There are lots of beautiful places to visit nearby. This is the card that we sent to the owners during our stay............ "Thank you for allowing us to stay in your delightful Pont Neo. We are having a wonderfully relaxing holiday. Days are spent exploring the numerous coves and beaches. We spend our evenings watching some of our favourite dvd's. Before we go to bed we listen to the owls, a delight to hear. Warm greetings from this special place. With love from Nick& Ian. Come here for an authentic Breton experience. 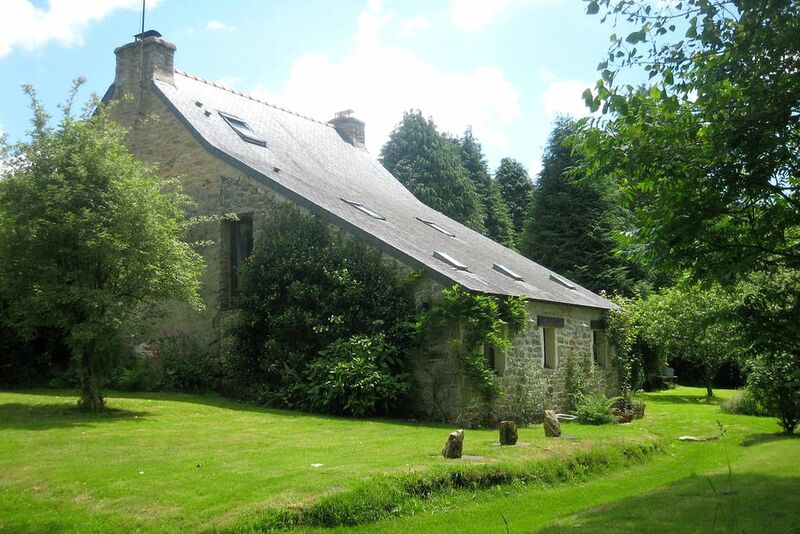 Land Pont Neo is a traditional stone-built cottage set in a couple of meandering acres bordered by woodland, a perfect place for daydreaming or playing in rural wilderness. Venture to nearby towns for markets, bakeries and supplies, and indoors, enjoy a sociable living space that welcomes you with the lingering scent of woodsmoke, cosy sofas, and armchairs in which to curl up with a book or a glass of good French wine. Sweep along the country lane with fields and farms on either side, into deepest Brittany – don’t miss the turning. There’s just one neighbour and quietness reigns. You’re within striking distance of three small, typically French villages – each no more than eight minutes’ drive. 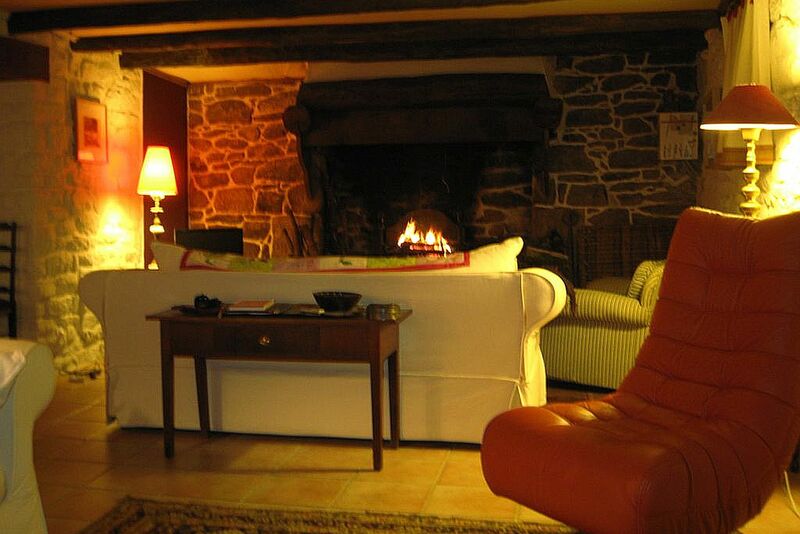 Querrien is closest, with a farm shop, bakery and restaurant, Le Pigeonnier. Quimperlé is around 15 minutes’ drive and has many good cafes and restaurants, such as La Cigale Égarée. We adore the fish restaurant of the Hotel du Pouldu at Le Pouldu's old port. Splash out on fruits de mers in the formal dining room or try the menu du jour at a table in the atmospheric bar. One of our favourite beaches is at Port Manech plage - very Monsieur Hulot. Great for kids, great for swimming and you can hire sailing boats too. When you've had enough, there's a fantastic bar right there, overlooking the beach. Pont Aven, with its restaurants and galleries, is just half an hour away. Very easy to loose the day mooching about with a headful of Gauguin and Van Gogh. Kayak tours set out from Quimperle and mozy down the totally unspoilt La Laita estuary past the Abbaye Saint-Maurice. You follow the tide and they drive you back. Just put on your wellies and follow the ancient footpath from the house to La Clarte. With its ancient church, web of lanes and old Breton houses, it's the sort of place Asterix might have lived. Tour the many brocantes & vide greniers looking for interesting bargains. You're almost bound to see things that you can't imagine seeing anywhere else. 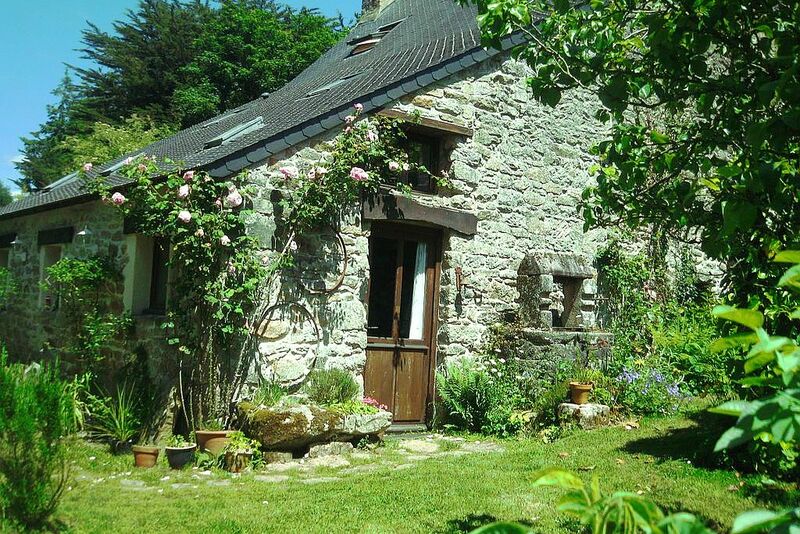 Helen and Gavin holidayed in Southern France and Brittany when they first got together, and Land Pont Neo was once their rented holiday home. When they saw it up for sale in 2010 they had to snap it up, and it’s been their second home ever since – part of the reason why it feels so homely. They live on the opposite side of the Channel in Plymouth but are happy to answer questions by phone.